Evolution in the Chianti Classico district has come on swiftly and decisively since the turn of the century, accelerating even more into the second decade. It’s no exaggeration to say that the wines are the best they’ve been since before phylloxera (and probably ever). For some historical context and background, see my article published last September. The pioneering producers listed below have been among the catalysts of positive change beginning in the critical period in the 1970s and 1980s when the region was in shambles. It was this group (and others beside) who helped get the region back on the rails to fine wine and bring it into the 21st century. It’s a great time to (re)-discover Chianti Classico. And with Canada now the 3rd largest export market, absorbing nearly one out of every ten bottles of Chianti Classico produced, availability is rising. The main positive developments in the region have mirrored the general worldwide aesthetic coalescence towards purity, the new measure of greatness that has replaced the old “concentrated” model. As anywhere, this requires winemakers to move into the background and allow site specificity to take over the fore, idiosyncrasies and all, a big leap of faith. Perhaps the most important philosophical shift towards purity was the realization that sangiovese, the region’s cornerstone, is not cabernet or merlot, as it was once treated, with a hopeful eye on international markets. Its maximum expressiveness is revealed with minimum effort in the winery and lavish attention in the vineyard. Like nebbiolo or pinot noir, sangiovese is fickle, unforgiving, delicate, and above all hyper site-specific. And the Chianti Classico zone is one magnificently complex patchwork of soils, aspects and elevations, enough variation to keep an enthusiast busy for years trying to sort it all out. Elevation in particular is one of the most important factors, with wines from, say the high elevations (up to almost 700m) of Radda in Chianti, Lamole, or the Ruffoli hill in Greve in Chianti more notably fresh, svelte and firm than the more powerful, lower elevation wines of Castelnuovo Berardenga or San Casciano, for example. Soils, of course, matter greatly to sangiovese too, and in the zona classica you’ll find many variations on marl and limestone, with more sand and clay in the lower valleys, and outcroppings of sandstone. Water holding capacity in particular has a dramatic effect on the way sangiovese vines physically grow here, so it’s no stretch to extend those differences to the winery and eventually the glass. As Paolo de Marchi, of Isole and Olena on the western edge of the appellation in Barberino Val d’Elsa describes: “Galestro soils [cool and compact sedimentary marls with more clay, which predominate in his vineyards] give weaker vines, but in a good way. They struggle under more stress and the trunks are smaller at the same age.” And the wines, like those of Isole e Olena, tend to be more finessed, with fine-grained tannins, rounded and balanced, delicate. “Alberese, on the other hand [more pure rocky limestone], gives bigger, more powerful wines, darker-fruited, with more astringent tannins. In great vintages the wines are excellent, but you need the right conditions. There’s less margin for error”, de Marchi concludes. A third geology/soil, called macigno (sandstone), according to Querciabella winemaker Manfred Ing, “exalts the florals, the lavender aromatics of Sangiovese, and gives lighter, more elegant wines”. The timing of harvest is one of the most important decisions a winemaker makes all year, and with sangiovese it’s particularly critical. Unwanted raisined fruit flavours easily permeate a wine, even with only a small percentage of overripe berries. It follows that gentle handling and bunch/berry selection are equally essential. The difference between the good and the great is often textural, the top wines showing polish without softness (sangiovese is not a soft grape and invariably has low pH in the Chianti Classico area), while the less successful present a certain asperity, a rough and tumble texture, from under or overripe fruit and overly enthusiastic extraction. The best operations I’ve visited use a selection table (or four, as at Fontodi) to sort the harvest before it reaches the vat. And gentle punch downs, pinot noir-style, are preferred to more violent pump overs. Sadly, there are few shortcuts to greatness. In Chianti Classico, you get what you pay for. It’s now widely recognized that new oak can easily overwhelm sangiovese’s delicate perfume, but an overly oxygen-deprived, reductive environment (e.g. stainless steel) exacerbates its peppery, hair perm solution character. The variety needs to breath. The top producers have almost universally retreated from new barriques and returned to large, old casks, or concrete, for ageing; barriques are used sparingly and rarely with any new wood in the mix. Vintage is a final important consideration. Weather varies considerably in Chianti Classico, from cold and wet, like 2014, to warm and dry, like 2015, or downright hot and drought-ridden, like 2017 (and 2018). But don’t judge the poor vintages too quickly. Tough years often prove to be much better than anticipated, as 2013 and 2014 are already showing. And these ‘bad vintages’ can age remarkably well. “Sangiovese needs a lot of time but is often able to recover from its defects,” shares Tommaso Marrocchesi of Bibbiano. In short, sangiovese is very un-Canadian. It won’t sit back and keep politely quiet, trying to get along with everybody. No, it’s more like a passionate Italian faced with a perceived injustice. Be prepared to hear about it. L’Uva è mobile, as Verdi might have sung. And indeed, the most enjoyable aspect of the convergence on purity for wine lovers is that differences are now encouraged, rather than suppressed. It was in any case a fool’s errand to try to fit all Chianti Classico into a single, international style category. Chianti Classico’s multiplicity of expression is part of its beauty, a fount of discovery and learning, and pleasure. It also means that not all wines should be judged by the same yardstick. Chianti Classico should come conjugated in a range of inflections from light and delicate to firm and structured, according to year and place, and, to a lesser degree, winemaking. Celebrate the differences. This is the key to sustainability for high-quality fine wine, and Chianti Classico is no different. While it makes the wine critic’s job more challenging, and the wine consumer’s purchases more fraught with the unknown, it also makes life more interesting and enriching. Own the unknown. It’s only a bottle of wine after all. But if you’re hesitant to jump in, start with wines from the ten benchmarks wineries listed below. They have captured the essence of their particular patch of the region and have been instrumental in leading the revolution towards purity. Needless to say, if you’re in the region, pay these wineries a visit. It’s a great start for your explorations. But first, a quick side note about the latest vintage that has started to trickle in, 2016. I find this to be a terrific vintage at the top estates, so lively and tense, neither overly ripe, nor green, just about perfect, and highly aromatic. The consorzio vintage report describes the 2016 profile as “standard”, with no extremes. “More than other, this is a vintage that highlights the features of Sangiovese: extract values, anthocyanins, polyphenols and unique and concentrated varietal aromas”, it continues. That’s just a long and complicated way of saying “normal”, which in the world of wine is a very good thing. Badia a Coltibuono is a beautifully maintained Romanesque abbey in atop one of the highest hills in Gaiole. The Giuntini/Stucchi-Prinetti family, proprietors since 1846, was among the first to bottle their best vintages of Chianti Classico when most were still selling in bulk (I’ve had excellent wines from the 1960s). All wines are certified organic, and the house style is firm and fresh, perfectly gastronomic (Emmanuela Stucchi also holds amazing cooking classes in the Abbey’s magnificent kitchen). Start with the 2016 Chianti Classico annata, an excellent, properly pale red colour, fresh red fruit-driven, vibrant, energetic, crunchy wine, a sangiovese lover’s Chianti Classico. The Casini Bindi-Sergardi family history runs deep in Tuscany, back to the 14th century. They’re proud owners of the exceptional Tenuta Mocenni, the family’s Chianti Classico estate in the northwest corner of Castelnuovo Berardenga, with the towers of Siena in view. Quality can be attributed in part to vineyards stretching up to 450 meters, an elevation that tempers the generally warm climate of this sub-zone. But soils are even more striking, impossibly stony, with mountains of both galestro and albarese on display. La Ghirlanda is the mid-range wine from a mix of galestro and albarese, the best value at the estate. Riserva Calidonia is from a single vineyard of old vines with heavier clay soils yielding more structure and tannic breadth. The estate’s Gran Selezione “89” is the top, pure sangiovese from a single plot of extremely stony soil numbered 89, planted in 1998 to an unknown clone with very small berry size. Aged in large old cask, it’s a classic floral and pot pourri-inflected expression, silky-firm, fine-grained, with terrific finesse, classy and sophistication. Marco Pallanti’s benchmark estate needs no introduction, initially established in the late 1970s by a group of four friends from Rome with plenty of enthusiasm for wine but little idea how to make it. They figured it out along the way. The property itself is a worth a visit, a virtual open-air museum of art installations, with a new exhibit added every year since the collection started in 1999, each produced by a well-known, international artist. But it’s the vineyards again that make Ama an exceptional place to make wine. Elevation is once again key, here reaching up to 500 meters, with limestone-rich, water retentive soils, useful in the region’s increasingly warm, dry climate. “Here, global warming is better than global cooling,” says Pallanti. 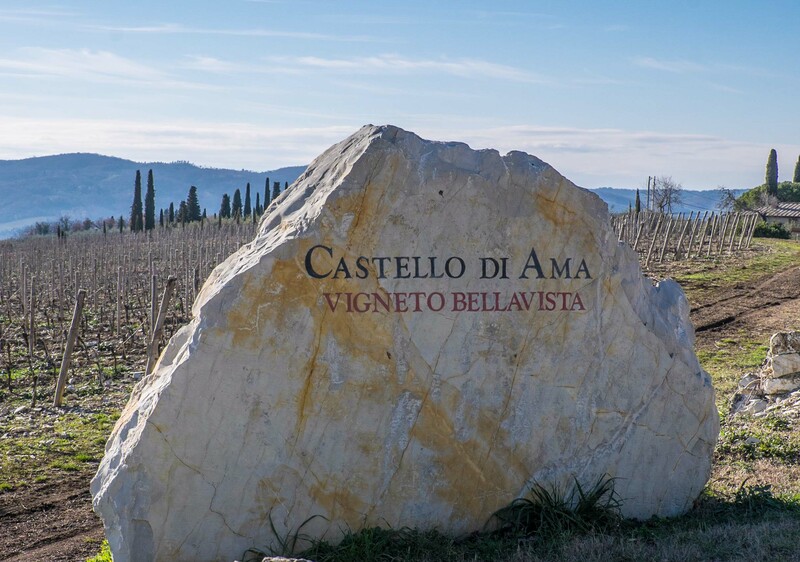 Ama is one of the few estates where small barrels are successfully used, even new barrels, without denaturing the florid character of sangiovese, and the entire range is excellent, featuring a rare combination of power and finesse and salty minerality. Vigneto Bellavista is the riper and showier of the two single vineyard gran selezioni, Vigneto San Lorenzo the more closed and cool, fine-boned and lean, more demanding bottling. Vigneto Casuccia, which includes a drop of merlot, is a the darkest and spiciest Ama wine, with powerful, dense, ripe fruit and plummy-herbal, woodsy character. A high percentage of alberese (limestone) contributes its tighter, chalkier nature. L’Apparita IGT Toscana is the pure merlot cru, the wine that first put Ama on the world map from the first bottling in 1985, it’s one of Italy’s best. Even the basic Chianti Classico “Ama”, made from the youngest vines, is superb. Volpaia is a reference in the commune of Radda in Chianti, a cooler zone that features more typically medium-bodied, elegant wines thanks to the highest average elevation in the Classico district. Indeed historically, fully ripening sangiovese in Radda was cause for celebration; it was considered one of the lesser communes in the region. But now, changing climate and new, earlier ripening clones have made it one of the most sought-after. Volpaia was purchased by the Stianti in 1966, originally to be used as a hunting reserve, but now wine is the focus. The house style tends towards peppery-reductive and wines are designed to age, like the excellent 2016 Chianti Classico with its juicy-crunchy acids and lean palate, but with genuine stuffing to ensure positive development. The Riserva is made from a top selection of all the estate’s vineyards, pure sangiovese, aged in old barriques and botti grandi. Gran Selezione Coltassala is made from a parcel, “at the right elevation, with the right soil, grafted to the right clones of sangiovese and mammolo” according to Federica Stianti. “Year after year the wines get better and the vines get older and older.” It’s a wine of great structure and architecture, best after a decade or more in the cellar. Fèlsina is a reference not only for Castelnuovo Berardenga, but Chianti Classico overall, producing truly exceptional wines. There’s an evident deep affection for sangiovese here: old clones found on the property have been singled out and propagated, parcels separated into micro-terroirs, and attention to detail applied at every stage of production. Admittedly, the vineyards are also naturally endowed, especially those used for the Rancia Riserva and Gran Selezione Colonia, both very stony, galestro and albarese-based, yielding wines of exceptional finesse but also structure. The brilliant 2016 Chianti Classico is a fine introduction, offering soaring aromatics, pure and fruity-stony-floral-herbal, the complete package. The Manetti family’s Fontodi Estate is the reference for Panzano, a small enclave within Gaiole that has its own association of producers. Purchased in 1968 by his father, Giovanni Manetti now runs the operation with much of the estate’s 90 hectares of certified organic vineyards in the prized “Conca d’Oro”, or “golden amphitheater” below Panzano. Manetti draws upon some of the best grapes in the classico area, which, despite the heat of the southerly slopes, yield some of the highest acid wines in the region, with a unique combination of suppleness and freshness thanks to the high limestone content of the soils. The Manetti family is also famous for terra cotta, both tiles, and more recently, amphora, and a large percentage of the wines are now aged in clay. Top end 2014 Gran Selezione Vigna del Sorbo is polished and open with marvellous perfume, but it’s the texture that really beguiles, the silky-firm, fine-grained tannins, the bright acids. The 2015 Chianti Classico is a wine of evident class and depth with complexity in spades, in a ripe and complete style, without the crutch of wood. Also seek out the latest project from a newly acquired vineyard in Lamole: the 2015 Chianti Classico Filetta di Lamole has a wonderfully natural feel, fleshy, fullish, open, salty and delicious, weightless yet consequential, floating yet anchored, the kind of wine you can drink all night. The de Marchi family arrived from Piedmont in the mid-1960s and purchased the adjacent estates of Isole and Olena on the western edge of Chianti Classico and amalgamated them into a single property. But it was the thoughtful Paolo de Marchi who has turned it into the benchmark estate it is today. Vines benefit from breezes off the Mediterranean (one of the few areas with any maritime influence) and enjoy slightly milder winters than Valleys inland, and cooler summers, despite relatively low elevation. The tempered climate gives de Marchi long hang time, which, coupled with mainly galestro soils, shepherds wines naturally in the direction of finesse, fine tannins, and fine acids. The 2015 Chianti Classico is properly translucent red-garnet, fleshy, concentrated, with high acid (in the right way), very succulent, salty and stony. Pure drinking pleasure. Cepparello is the estate’s excellent IGT, a pure sangiovese named after a stream on the property, selected from the best lots. This wine ages magnificently, as a tasting back to 1995 in 2017 clearly showed. Vittorio and son Iuri Fiore’s Poggio Scalette, along with neighboring Querciabella, are the addresses to know in the Ruffoli sub-zone of Greve in Chianti. High elevations, up to 600 meters, and predominant sandstone conspire to produce particularly floral, elegant wines. It’s hard to imagine how such stunning wines could emerge from such a tiny, rustic cellar, but it only shows that vineyards trump cellar (a new cellar is planned). The 2015 Chianti Classico, a pure sangiovese fermented in stainless and concrete and aged exclusively in concrete, is lovely and fresh, immediately engaging. Il Carbonaione Alta Valle Della Greve IGT is the top wine, selected from the best lots in the cellar, though one special century old parcel of sangiovese (perhaps the oldest vines in Chianti Classico, which includes a small percentage of other local grapes) always makes the cut. The 2015 is redolent of very ripe cherry fruit, also very floral, though with big tannic structure and broad shoulders that need some time to resolve in the cellar. Certified organic since 1988, and practicing biodynamics since 2000 (also vegan), Querciabella farms vineyards in three communes – Greve, Radda and Gaiole – though the winery is on the Ruffoli hill in Greve. Here, South African winemaker Manfred Ing sources his lightest, most ethereal sangiovese from high elevation, sandstone-based vineyards, 350-600m, “above the clay line” in Ruffoli. The winemaking aim is “Burgundian” (the name of the estate’s excellent Batàr Chardonnay, is a not-so-subtle nod to Montrachet’s Bâtard – but it is one of Italy’s greatest). The entire range is precise and technically impeccable. Fine Chianti Classico and Riserva are both blended from the three communes, and show a touch of the reductive house style, meant to age. Camartina IGT is an accomplished blend of 70% cabernet with 30% sangiovese, particularly elegant, Margaux-like. Luca Martini di Cigala’s grandmother was a Ricasoli, and indeed this storied property in Gaiole used to belong to the Barone Ricasoli’s land holdings, so history stretches deep in time. The shift to quality wine began in the early eighties under Martini, and all of the effort is poured into the 30 hectares of vineyards. With the average elevation around 300m, it’s notably warmer here, and Martini describes the climate as “more like Montalcino”. This is reflected in the wines, which are more deeply coloured than the mean, more darkly fruited, and intensely structured and extracted naturally, without effort – these wines age very well, and very slowly. The 2016 Chianti Classico is saturated with flavour and abundant, ripe but furry tannins and should be spectacular sometime after 2020, the 2015 even more powerful and ageworthy. A beautiful 2014 Chianti Classico Riserva grows in class and elegance in the glass, shifting into an engaging floral-herbal-resinous expression, cinnamon-heart-tinged, genuinely salty, more of an elegant country wine than a sophisticated urban expression. Top end, pure sangiovese Percarlo is made from a vineyard selection of the smallest bunches, from the top eight hectares of the property, with a high percentage of sandy soils on underlying clay favoured by Martini. It’s a meaty and savoury wine of spectacular depth.